While the tax laws can be complex and somewhat confusing for the average business person, this article has been created to provide a basic understanding associated with GST on low value imported goods. A little background to start with. The ATO has been keen to crack down on oversea businesses avoiding the payment of GST on sales created in Australia. In recent times you may have noticed that GST now applies to your monthly Electronic Distribution Platform (EDP) service invoices from Google, Apple etc. The same is now being applied to low value imported goods that are typically processed through a mail delivery service. To implement the collection of GST on LVG, a number of changes had to be made so that the Australian Government can keep tabs on the collective value of goods imported by each overseas supplier and if GST has been applied at time of purchase to avoid double taxing. To facilitate this the Integrated Cargo System (ICS) has been changed to record the suppliers ABN or Vendor ID, GST codes etc on the Self-Assessed Clearance (SAC) declarations. How it will work and documentation. Overseas suppliers doing more than AUD$75,000 of trade into Australia will need to register with the ATO for GST. In effect, these suppliers will need to quote to the Australia purchaser, a cost price including GST if registered for GST. When you purchase such LVG items from registered GST suppliers, the parcel will be considered as a domestic sales and not an importation. So in-effect, the main consideration is that you have a GST credit on business related goods and any cost / price adjustment. Your supplier will need to include an invoice that clearly shows any GST paid in the purchase price. Other Shipment Methods of LVG - If your goods are not being forward from the port of entry, other fees may apply such as port fees to remove the supplied goods from shipping containers and arranging freight forwarding. These fees are determined by private stevedore and freight handling operators. Online Sales of LVG - Suppliers, including merchants, electronic distribution platform operators and re-deliverers including on-line marketplaces like eBay and Amazon will need to register with the ATO, collect GST at the point of sale and remit that GST to the ATO. Shipment with a value over AUD$1000 (See notes on Custom Value below) will be held by Customs until payment of GST, Duty and other fees are covered by the importer. 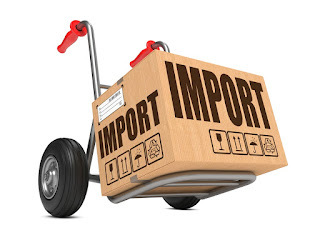 The Importer will receive notification of the arrival of the goods and details to process payment. It is important that all Customs required information is provided to ensure goods are promptly released and forwarded. Some importers will engage the services of a Freight Forwarding and Customs Clearance Agent to process the relevant documentation and fees. The majority of goods will attract a 5% duty rate depending on the goods and any free trade agreements. GST is applied on the value of the Goods (aka the Customs Value - CV) + Duty + Transport and Insurance (T&I).